SNC challenge : Many of the bloggers must be aware by now of the event started by Divya of You Too Can Cook , yes, it's the most popular SNC, South vs North Challenge. 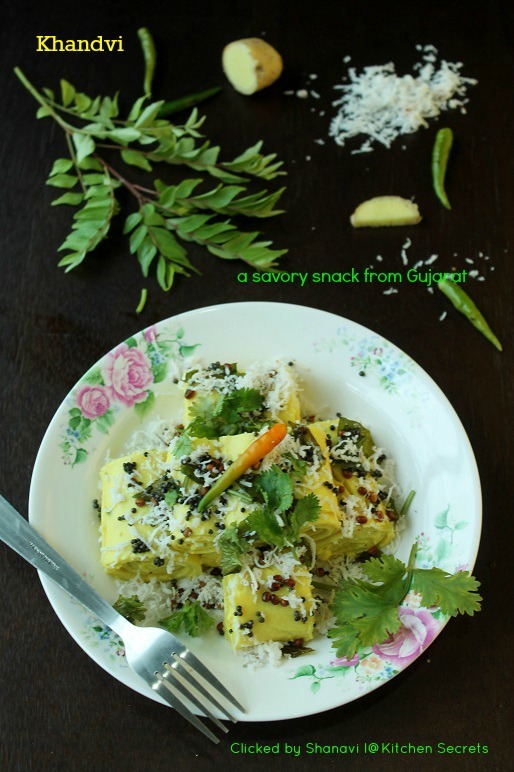 For this month, the challenge for the southern team is Khandvi , challenged by Hetal of Gujarati zaika. I've finished mine in the nick of time.. ooof. Check it out guys..
Take equal amount of ginger and green chilly , grind them with little bit of salt and make a slightly coarse paste. Store them in the refrigerator if u have remaining. Grease the counter top, if it's granite/marble , else grease a couple of Thali plates with little bit of oil and make it ready. In bowl add a cup of Besan flour , 1/2 cup of sour yogurt, 1 1/2 cups of water, salt, sugar, ginger green chilly paste, turmeric powder. Whisk well and form a batter without lumps. Heat a kadai, preferably non-stick pan, pour the batter and slowly stir in the mixture until it gets cooked. Keep on stirring so that it's lumps free and evenly cooked .It would take 8 to 10 minutes. By the time, the mixture would get cooked and become thick, would start leaving the pan while stirring. 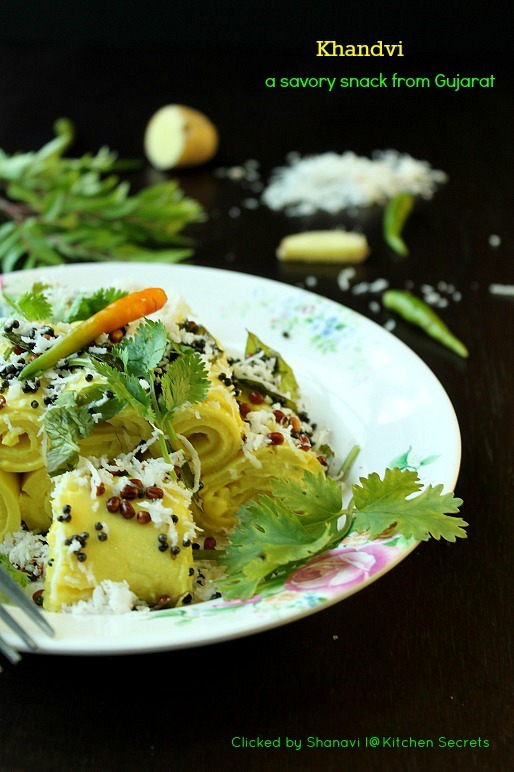 This would be the right time to switch off the heat and get on with the making of Khandvi. Pour a spoon of the batter and spread it. Try to roll after few seconds. If u r able to roll , then the batter is cooked, if not cook the batter for another 2 minutes. Now place the cooked batter on the greased area/ thali plate immediately and spread the batter to form a very thin sheet. Allow the set up to dry for 5 minutes. It will take more time, in case you have spread it thick. Now using a knife cut into broad strips of 2 inches like ribbons. Now roll each strips separately and place on a serving dish. Heat a small pan with oil and do the seasoning with mustard seeds, sesame seeds, green chillies, red chilly, hing, urad dal, curry leaves. 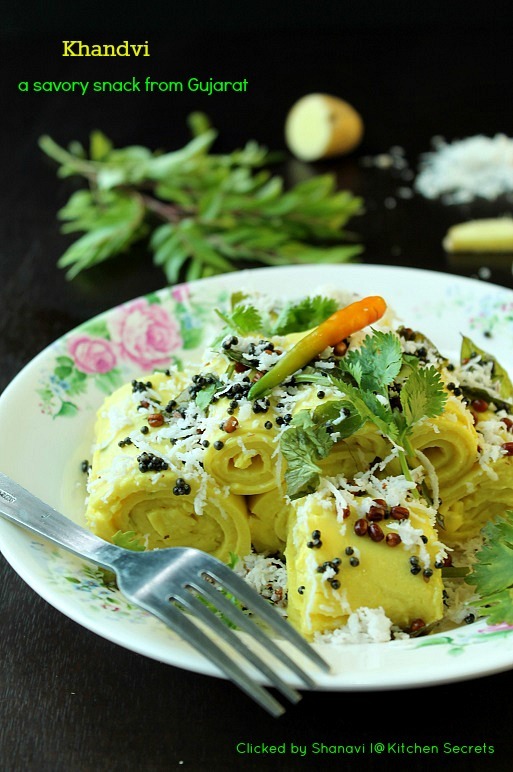 Now pour this seasoned mixture on top of the Khandvi and garnish with coconut and coriander leaves. Make sure the uncooked batter is lumps free. Also keep stirring the batter while it's cooking else it would turn lumpy and uneven. Spread the cooked batter at once after removing from the stove else u'll not be able to make Khandvi. Also spread the cooked batter to thin strips , this takes minimum time to dry ,rolls up fast, also makes a perfect Khandvi. Superrrr shobana...plan to mate 2moroww,my fav snacks!! The clicks are worth dying for.....gorgeous!!!!!! The khandvi looks delicious. 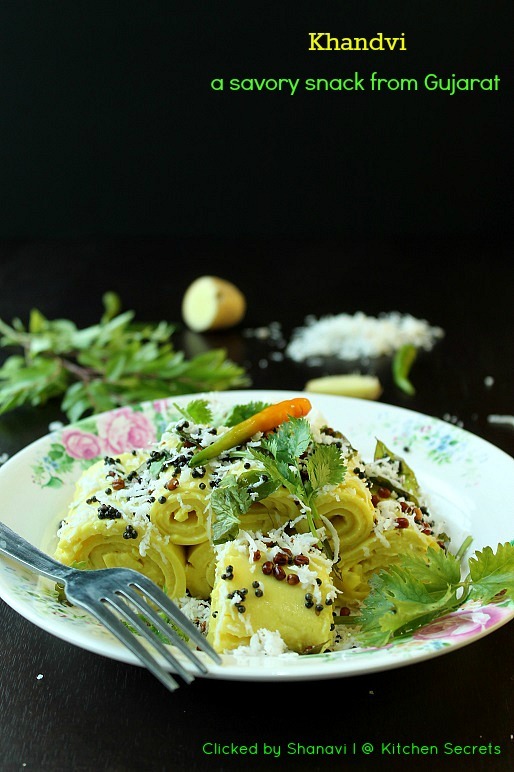 You have done a wonderful job there dear,prefectly rolled khandvis..inviting platter. Yumm Totally forgot about this Sho...Going to rush now and it is very tempting.. Perfectly rolled,superb presentation and clicks. First time here.happy to follow u,glad if u follow mine.